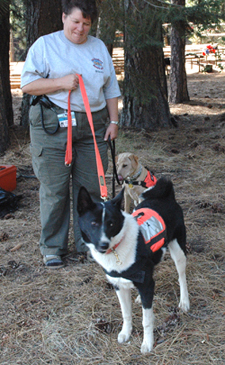 Actively involved in SAR work since 1987, both Madde and Rob are currently active volunteer members of California Rescue Dog Association (CARDA), a state-wide volunteer organization, and the Butte County Sheriff Search and Rescue Team (BCASR). Madde has been a mission ready K9 handler since 1990. Her first two canines were mission ready with CARDA and BCSAR in wilderness, water and cadaver searching. She has also done training in disaster and avalanche.Madde has held the position of Lieutenant in charge of training and public relations on the Butte County SAR Team. She was Training Advisor for CARDA for eight years. As training advisor Madde has set up monthly training, testing and evaluations of teams. She has been a sponsor for many K9 teams training to become mission ready, working with them to develop their training and skills in preparation for their mission ready test. At this time Madde is a district representatives for eight counties for CARDA and operates as a liaison between the responding CARDA search teams and the requesting agency. Further she is a contact person for anyone interested in becoming a K9 handler with CARDA. Rob has held leadership positions on the Butte County SAR Team and has managed dog operations, planning and deploying teams on missions. He has extensive experience in search operations, incident command, rescue, water search, wilderness/urban and cadaver searches and has participated in avalanche and disaster training. Rob was the first certified technical support person in CARDA. Together Rob and Madde have trained their own dogs in multiple disciplines. After working with many people over the years who all wanted to know how to get started in SAR work, Rob and Madde produced Search Dog Training: How to Get Started. This training tool visually presents the “big picture” of what is required to train a search dog and the commitment it takes to get a K9 to mission ready status. Since the production of their video, Madde and Rob have done seminars in the western United States and Canada. They also produced Helicopter Operations and Safety: Working with K9’s, another visual aid to assist in the training of search and rescue dogs. Above, Madde and California Karelians' Kandy attended SAREX 2006, sponsored by Butte County Sheriff Search and Rescue Team (BCASR), where 275 law enforcement and SAR personnel participated in search and rescue training. Above, Madde is now training her third dog, Dixie, for urban trailing and cadaver work.